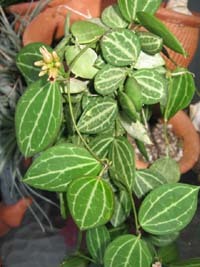 This dischidia has beautiful foliage that resembles little watermelons. The leaves get a reddish color in the sun. 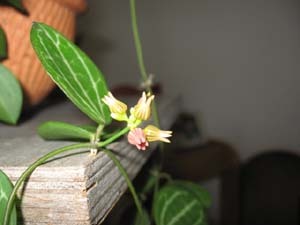 The flowers are greenish-yellow with purple lines, but this plant is grown for it's beautiful leaves. The flowers are not that showy. 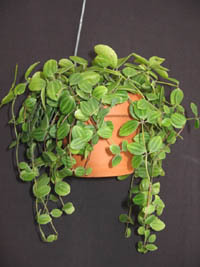 It makes a nice hanging basket, but also does really well as a mounted plant. Originally from SE Asia and Northern Australia. 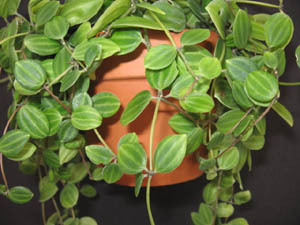 Dischidias are "Hoya cousins!" They are easy to grow and don't require much attention. They do best outside in filtered light or indoors with lots of light. They like to have good drainage. Fertilizer is average and it is best to avoid freezing temperatures. 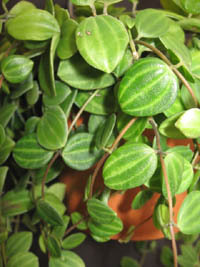 Dischidias do flower, ususally during the warmer months. 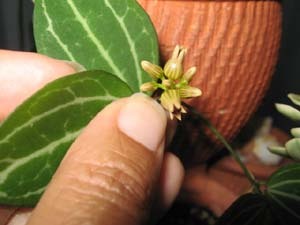 The flowers usually arent very showy or fragrant. 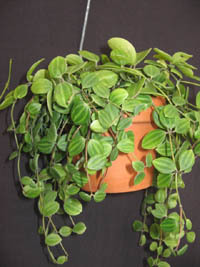 Dischidias are plants you enjoy for their beautiful foliage and in hanging baskets or mounted.